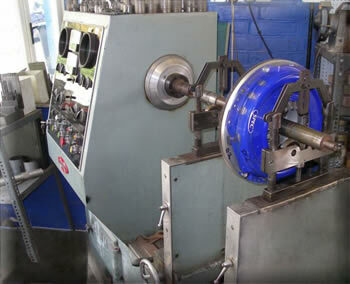 PhoenixMotorsport carries out dynamic balancing on a whole range of items, from the popular balancing of crankshafts, flywheels and pulleys, to the less common driveshaft, propshaft and viscous coupling and fan balancing. Dynamic, or multi-plane balancing differs from static balancing in that it balances an item along its entire length as opposed to static balancing which balances an item in a single plane, as in a narrow disc. Dynamic balancing, as we have all seen in basic form on car wheel balancing, adds weights to both the inner and outer rim to balance. The dynamic balancing of a shaft, eliminates or substantially reduces vibrations along the length of the shaft, greatly reducing the vibrational loads on the shaft and bearings. PhoenixMotorsport can balance the whole “bottom end” of your rotating assemblies, with the front pulley, crankshaft, flywheel and clutch all assembled together and dynamically balanced. Then our engine preparation department can balance your other reciprocating components, i.e pistons and connecting rods for a fully balanced, short engine assembly. For specialist balancing, we can have the CNC dept, manufacture a special mandrel to hold your item in the machine which you will then be able to keep for future use.